Heat the olive oil in a medium to large saute pan over medium heat. Add the ground beef, Italian sausage, or ground turkey, and the chopped onion. * Cook until the meat is no longer pink (breaking up the meat with a fork as you go). Drain the meat and onion mixture and place in about a 4 qt. slow cooker. Add the remaining ingredients, except for the ricotta cheese. Cover and cook on low for approximately 4 1/4 hours. Stir in the ricotta cheese just before serving. Serve over hot cooked pasta. Garnish with freshly chopped parsley. Store leftover sauce in the refrigerator up to 4 days. Freezes well up to 3 months. You can saute the meat with the onion and prep the vegetables the day before if it helps. 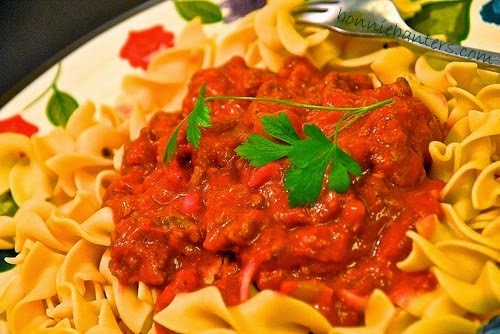 Enjoy this warmly satisfying sauce over your favorite pasta with a good salad and crusty bread!